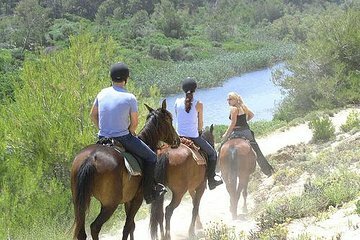 Descubra la escarpada costa norte de Mallorca a caballo y luego regrese al rancho para una cena de barbacoa y baile. Empiece por un sendero escénico en la costa norte de Mallorca por la noche. Dependiendo de tu nivel de experiencia, continuarás a través de hermosos bosques con la costa mediterránea a lo lejos o disfrutarás de un galope en la arena. Después de su viaje, regrese a los establos para disfrutar de una abundante cena a base de carne, ensalada, pan y fruta a la brasa servida con sangría española, antes de terminar la noche con bailes y música country en vivo. Noche de aventura a caballo en Mallorca. Recorra los senderos y admire el paisaje pintoresco. Disfrute de una típica cena de barbacoa en Mallorca servida con la famosa sangría española. Bailar al ritmo de la música country en vivo. Visita a la mini granja de pollos y conejos del rancho. En los hoteles seleccionados de Mallorca, subirá a bordo de un autobús con aire acondicionado destinado a Rancho Grande, un rancho tradicional ubicado en Son Serra de Marina. A su llegada, recibirá un refrescante vaso de sangría y formará grupos de acuerdo con su habilidad para montar a caballo. Luego, siéntate y disfruta de un paseo de 1,5 horas a través de un escabroso paisaje mallorquín lleno de flora y fauna. Los jinetes principiantes e intermedios explorarán el bosque a un ritmo relajado, mientras que los jinetes expertos galoparán a lo largo de la hermosa curva de la costa de Mallorca. Después de su paseo, observará a los adorables animales bebés en la granja del rancho y luego revitalizará con una merecida cena de barbacoa. Deléitese con la carne, el pan y la ensalada a la parrilla mientras toma bebidas como la sangría, el jugo de naranja o el agua. Sado, sumérjase en el espíritu del rancho durante una sesión de baile en línea llena de diversión acompañada por música country. Baile, beba y diviértase antes de regresar a su hotel en un vehículo con aire acondicionado. Consulte el Itinerario para obtener una lista completa de las zonas que incluyen la recogida y regreso al hotel. Absolutely magical! I want to do it again 100 more times. You're split into groups depending on how fast you want to ride and how experienced you are, and despite there being so many people and horses in one group, I was very impressed with how organised and smooth everything was! I went for the gallop group, and it was absolutely mind blowing. The horses take off VERY fast, and the whole team was 100 competent and I never felt unsafe. And the evening dressage show was just magical, my jaw was hanging open the whole time and I think I'm re-evaluating the career I want in life. Overall, if you only do one thing in Mallorca- do this!! You won't regret it. This turned out to be a terrible experience - we were staying in port soller highly recommend this area if you want to get away from tourist traps. Unfortunately, this activity specifically targets tourist traps and were not flexible with very unpredictable public transportation. also, please note that this is booked through another agency which then books with the organization of the activity. so for any communication, theres a vicious cycle of pointing the finger. The staff was very courteous and friendly and I loved how they were fluent in so many languages so they could communicate with everyone. The ranch was beautiful and my husband and I had a great time riding, drinking, and dancing throughout the night .The food and drinks were delicious and the after dinner entertainment was incredible. This tour has a lot of promise and is at a great venue. It also offers some really beautiful views of the Mallorca countryside. I love horses so this was really attractive to me. The complaints I have, thought, are that I was picked up at 3:30pm from my hotel and was taken to the ranch, about an hour drive from the city. This was OK with me, I expected that and enjoyed seeing some of the country as we drove along. However, there was a couple in the van with us who did not speak english and they were given all kinds of information in Danish the entire trip, while the rest of of who did speak english were not spoken to AT ALL the entire ride. And we were all on the English speaking trip, as requested. We were also not spoken to when we arrived at the ranch and not given the same instructions, leaving us confused. The actual ride did not start until after 6:00, leaving us just sitting around with nothing to do until then. There are farm animals on the property to see, but not enough to see for almost 2 hours. After the ride, we were also waiting around for at least an hour before dinner because they had another group coming in for the sunset ride and we had to wait for them to start and finish their ride. We then had to wait for them to finish their dinner before we could start the dancing and music. After the 1 hour drive back to the city, we did not return until 11:30. I think it could have been coordinated a lot better and there was too much waiting around. If I had known this, I would have done the sunset ride. The evening one had about 1.5 - 2 hours worth of activity, and entertainment and 5-6 hours of just sitting in the van or sitting around at the ranch.